Situated in a regional park, this luxury hotel is 0.3 mi (0.5 km) from Piazza delle Sorgenti and 2.9 mi (4.6 km) from Horti Leonini. Chapel of our Lady of Vitaleta and Palazzo Piccolomini are also within 9 mi (15 km). Situated in San Quirico d'Orcia, this spa hotel is 0.1 mi (0.1 km) from Piazza delle Sorgenti and within 6 mi (10 km) of Horti Leonini and Chapel of our Lady of Vitaleta. Pienza Cathedral and Abbazia di Sant'Antimo are also within 16 mi (25 km). This family-friendly San Quirico d'Orcia hotel is located in the historical district, steps from Palazzo Chigi, Collegiate Church of San Quirico, and Horti Leonini. Chapel of our Lady of Vitaleta is 2.2 mi (3.5 km) away. 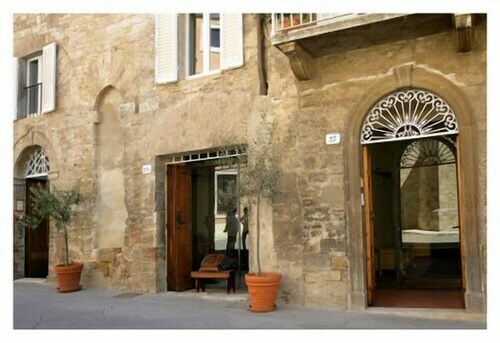 Situated in San Quirico d'Orcia, this hotel is steps from Palazzo Chigi, Collegiate Church of San Quirico, and Horti Leonini. Chapel of our Lady of Vitaleta is 2.2 mi (3.5 km) away. Situated in San Quirico d'Orcia, this romantic townhouse accommodation is steps from Palazzo Chigi, Collegiate Church of San Quirico, and Horti Leonini. Chapel of our Lady of Vitaleta is 2.1 mi (3.4 km) away. How Much is a Hotel Room in San Quirico d'Orcia? Hotels in San Quirico d'Orcia start at $89 per night. Prices and availability subject to change. Additional terms may apply. 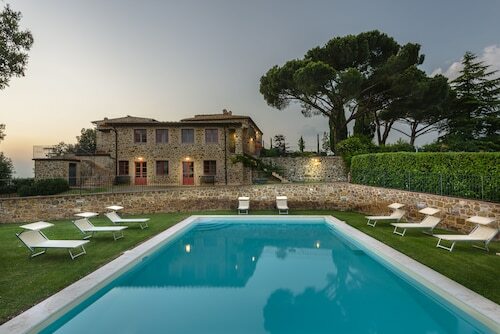 Inspiring accommodation alternatives are in abundance in San Quirico d'Orcia. Travelocity's database lists 43 accommodation options within a 6-mile (10-kilometer) radius of the center of San Quirico d'Orcia. 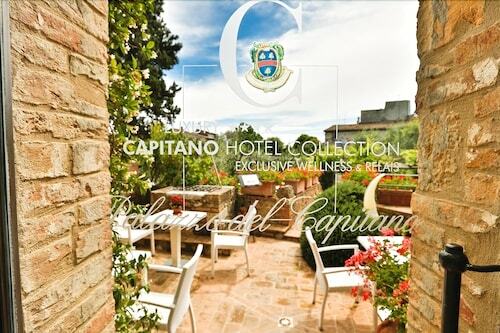 Modern global roamers who appreciate the many benefits of basing their adventures close to the restaurants, bars and entertainment of the city center should look at the Wellness Center Casanova Hotel e SPA and Palazzo del Capitano Wellness e Relais, which can be found within 0.6 miles (1 kilometer) of San Quirico d'Orcia's urban center. The Agriturismo Il Rigo is positioned 2 miles (3 kilometers) away from the center of San Quirico d'Orcia and is an ideal option for those who are watching their budget. Alternatively, you may like to check out the Hotel Casa Lemmi. It's worth having a look at the Castello Banfi - Il Borgo along with the Rosewood Castiglion del Bosco. The Castello Banfi - Il Borgo is located 12 miles (19 kilometers) outside of the center of San Quirico d'Orcia. The Rosewood Castiglion del Bosco, can be found just 9 miles (15 kilometers) away. 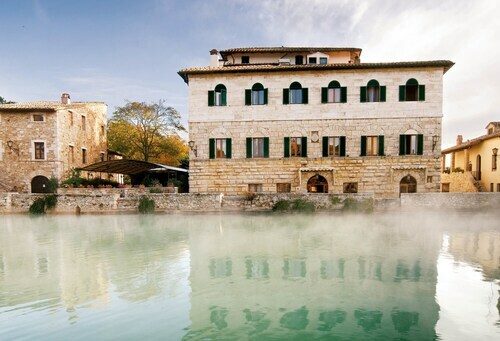 Other alternatives around San Quirico d'Orcia include the Castello di Velona SPA Resort & Winery and the Adler Thermae Spa & Wellness Resort. After you've got a feel for San Quirico d'Orcia, why not tour a little bit further afield? The Tuscany area has countless things to offer tourists. Investigate Tuscany's ruins and be sure to relish its rural landscapes, beaches, coastal plains and rivers. Visitors and locals alike in this corner of Italy often love snowboarding, skiing and snow shoeing. Val d'Elsa is 35 miles (56 kilometers) to the northwest of San Quirico d'Orcia and features Archeological and Collegiate Church Museum and Torre Rognosa. Travelocity-listed Val d'Elsa places to base yourself include the Tenuta Di Mensanello and Torraccia di Chiusi. For another option, head to Val d'Orcia, 3 miles (5 kilometers) to the south of San Quirico d'Orcia, where you'll find the Hotel Osteria Dell Orcia and Locanda del Loggiato. The Collegiate Church of San Quirico and Palazzo Chigi are some of the more popular sites to visit when in Val d'Orcia. Peretola Airport can be found 55 miles (89 kilometers) outside San Quirico d'Orcia's city center. Should you want to find accommodation in the area can find a night at the The St. Regis Florence or The Westin Excelsior, Florence. we loved this b&b - top of the town across from a church on a lovely piazza - very quiet with great restaurants around the corner, beautiful rooms, attentive staff, free internet, feather pillows and dreamy bed. Immaculate, super quiet, fantastic breakfast and grounds. Only downside was no english tv (bbc) and the parking was 100 meters straight downhill (you can drive up and drop off your luggage in front and then park). The staff person got in the car to help my husband park. We would stay here again in a minute. LE Bandite 12 Sleeps, Villa With Private Pool at Exclusive Use!